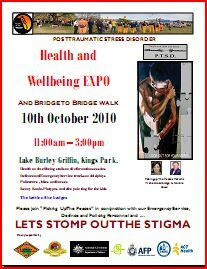 Hundreds of people are expected to gather at Canberra’s King’s Park, near the Carillon, on Sunday, 10/10/10, for the 3rd National Post Traumatic Stress Disorder (PTSD) Awareness Day. Picking Up the Peaces has designed this day to give hope to the 1.4 million Australians suffering this debilitating anxiety disorder. It’s a day designed to provide information that will help families and workmates understand how they – and those suffering – can cope with the changes PTSD brings. The ACT and Australian Governments are supporting Picking Up The Peaces – a Canberra-based community group with a national focus – to raise awareness so that those affected can be diagnosed and treated before their lives and the lives of their loved ones are ruined. 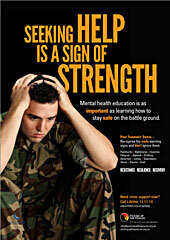 PTSD is an anxiety disorder which can develop as a result of experiencing a traumatic event. About 25% of people who are exposed to traumas such as a serious accident, physical or sexual assault, war or torture, or a natural disaster such as a bushfire or a flood, develop PTSD. The latest Australian Bureau of Statistics figures on mental illness indicate that 6.3% of all Australians suffer from PTSD – 50% more than suffer from the well-known effects of depression. Unfortunately, many people with PTSD remain undiagnosed or fail to seek treatment due to the stigma attached to the illness. And even when they do seek help, they may be confronted by a lack of community and professional awareness and understanding. Among those at risk of contracting PTSD are Emergency Service, Police and Defence Force personnel as a result of the nature of their work – the very people who put their lives on the line to protect our community. Treatments are available and the sooner they are applied, the more benefits they can provide. Early intervention is a key factor in healing strategies. 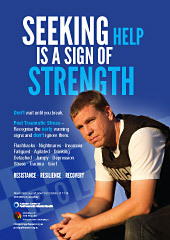 information for individuals and families on where to go for help and support. Please help raise awareness of this debilitating condition… and join in the fun. 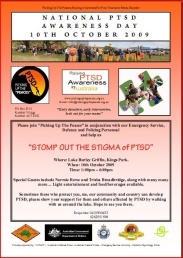 Picking Up The Peaces celebrated the 2nd National Post Traumatic Stress Disorder Awareness Day at Lake Burley Griffin, Canberra, on Saturday October 10th, to help stomp out the stigma of PTSD. Below is the agenda. There’s a brief awareness day report here. 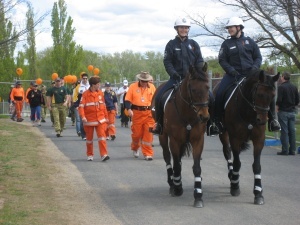 National PTSD Awareness Day was officially declared and supported by the Federal and ACT Governments in 2008, after a campaign by Picking Up The Peaces. 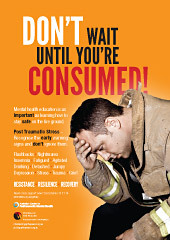 It has now been cemented into the National Mental Health Week program. Our first PTSD Awareness Day walk attracted more than 500 walkers, and was opened by the ACT Minister for Police and Emergency Services, Simon Corbell, and the Australian Minister for Veterans’ Affairs, Alan Griffin. That number doubled in 2009.